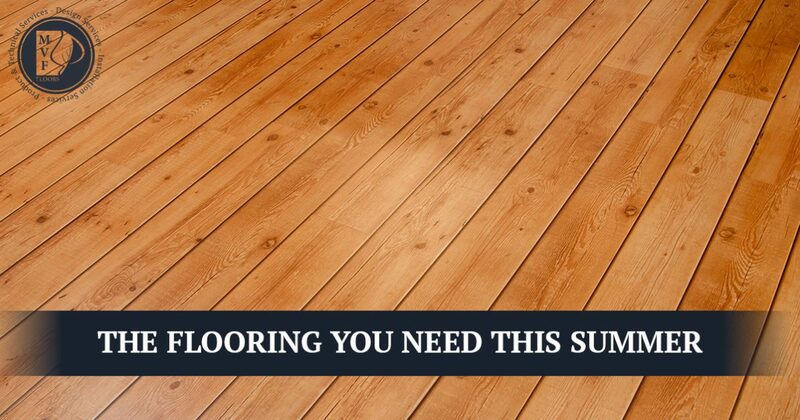 Summer is the perfect time for home renovations — and every great renovation starts with new flooring. But what kind of flooring is perfect for your home? In this blog, the Fort Collins flooring installers at Mountain Valley Floors will discuss some of the hottest flooring options in summer 2018 that could be perfect for your home and your lifestyle. Check out these great flooring materials, and choose Mountain Valley Flooring for all of your flooring needs! Engineered hardwood is one of the trendiest flooring options of 2018 giving you the perfect combination of beauty and affordability. With a hardwood veneer top layer and a composite base, these floors look just like hardwood floor but are more resistant to stains and warping over time. Cleaning is a breeze — just use a slightly damp mop or your swiffer to keep things neat and tidy. Want the look of wood, stone, or ceramic flooring, but don’t want to deal with all the stain removal and upkeep? Waterproof Core flooring is the perfect choice for your home. These floors are extremely water-resistant and stain-resistant, so you can put the look of wood floors in your kitchen or bathroom, have ceramic in a high-traffic hallway or entryway, or bring stone into the bedroom. With no scuffs, no stains, and no water damage to your floors or subfloors, you have the look you want, wherever you want it. Tile fell out of favor in the mid-to-late 2000s — and for no good reason. Whether it’s travertine, wood-look, slate, marble, or granite, tile is a versatile, beautiful, and durable flooring material that can make any space a show-stopper. There are tons of styles and colors to choose from, so your design options are limitless! Plus, tile flooring in kitchens and bathrooms offers better impact resistance and stain resistance than wood flooring or other traditional flooring options. Some flooring materials move with the ebbs and flows of interior design trends. But other materials are truly timeless. There’s nothing that can replace the softness, comfort, and amazing in-between-your-toes feeling of some high-quality carpet; it will always be the top choice for bedrooms, living rooms, home theatre rooms, dens, offices, hobby rooms, and basically any rooms that aren’t your kitchen or bathroom. While there isn’t a carpet on the planet that will deflect a spilled glass of red wine, carpet manufacturers have gone to great lengths over the past few years to make carpets more durable and stain-resistant so you can spend less time worrying about stains and more time enjoying the most comfortable flooring option on the planet. Pick a low-pile carpet for high-traffic areas and vice-versa, and you’ll have cushy and well-kept flooring that the whole family will enjoy. There are plenty of great flooring choices for your summer 2018 home remodeling ventures — but only one choice for flooring installation in Northern Colorado. Mountain Valley Floors has served Fort Collins, Loveland, Greeley, and the surrounding communities for over 25 years by providing top-tier flooring materials and services. Whether you need new carpet for your office or an amazing tile floor for your kitchen, we can help. Schedule a free consultation with our interior design stylists today — they’ll find flooring that’s perfect for your style and your budget!